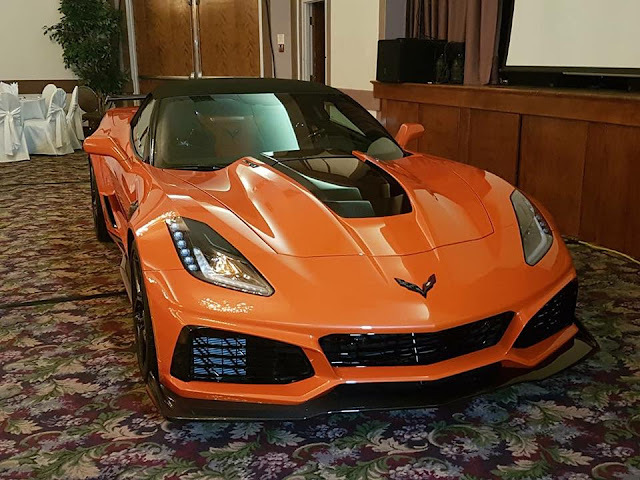 Kingston, Ontario was the latest scene of Canadian Corvette action as Eastern Ontario Corvette hosted their first big event in the Limestone City. With participants representing no fewer than 23 clubs in Ontario, Quebec and the United States, attendance was impressive. Around 20 Capital Corvette Club members, including us, drove the 200 kms from Ottawa to enjoy the festivities. Not being all that familiar with Kingston, this was our opportunity to see the city and its attractions. After a pleasant drive down Highway 15 from Smith's Falls, we drove directly to our first stop: the Kingston Penitentiary. Originally constructed between 1833 and 1834, and receiving its first six prisoners in June 1835, the Kingston Penitentiary (then called the Provincial Penitentiary of the Province of Upper Canada) was the largest building in Upper Canada. It was constructed under the supervision of an American, William Powers, who modelled the institution on one in Auburn, New York. As first conceived, it consisted of a single limestone cell block containing 154 cells in 5 tiers, along with outbuildings to house workshops, administration offices and other essential services. The original cells were 28 inches wide (! ), 8 feet deep and 6.7 feet high. During major renovations from 1895 to 1906, every other wall was removed between the cells, doubling their width, and these remained in use until the prison closed in 2013. Visitation area, where inmates could speak to visitors via telephone. Other visitation areas allowed for direct meetings around small tables with clear tops. Women's prison, with bars on the lower floor windows. The upper floors were two apartments for the staff. The small structure housed the office of the Warden, and isolation cells were originally located underneath it. The site was chosen as it was centrally-located in the province and its position directly on Lake Ontario allowed the transfer of prisoners by water, as opposed to the high-risk method of bringing them in by horseback. The penitentiary was expanded in the 1840s and 1850s to include three more cell blocks. It also housed a small women's prison for a number of years. At the time of its closure, the Kingston Penitentiary could accommodate 564 maximum security inmates. Charles Dickens visited it in 1842 and made a favourable report on it. However, two large-scale riots took place during its operation, one that lasted two hours in 1954, and a major uprising in 1971, that went for four days, saw the death of two inmates and the destruction of much of the prison. Under the central dome is a guard unit, connected by underground passage to secure areas, including an arsenal. Guards in the prison did not have firearms but did have truncheons. This Corvette-driving scofflaw is pictured in a standard width cell, double the original size of 1835. Our tour was very enlightening as in addition to the amusing young tour guide we heard from a number of retired Corrections Canada personnel who had worked in the penitentiary. One of the most entertaining was a male nurse who had worked in the psychiatric hospital, a unit separate from but located on the grounds of the institution. We had been warned at the beginning that our tour might be extended a bit but the stories were great. This curious vehicle is a 1935 pumper truck serving the penitentiary fire department. Cobbled together from a 1934 Ford pickup truck and a 1935 American LaFrance pump, it eventually received a 1948 Ford flathead V8 engine. The modernization of fire protection through sprinkler systems and other devices eventually made these low-budget solutions obsolete. Corvettes in the parking lot next to the Kingston Penitentiary. The stone walls and guard towers were built in 1845, replacing a 12 foot tall wooden picket fence. On Friday evening official events of the Corvette Invasion began with occupation of rhe downtown Ontario Street and Market Square by more than 235 Corvettes, with parking impressively directed by the volunteers. Corvettes from all seven generations were present, bearing a remarkable collection of personalized license plates (these will be the subject of a separate post!). There were track cars, stock cars, restomods, four Callaways, and even a rare 2009 Corvette limited edition car celebrating the marque's LeMans class win that year. There were throngs of local citizens admiring the shiny cars under the clear skies of the first day of summer. The Kingston Police Pipe Band played on the steps of the beautiful 1844 City Hall and we were welcomed by the shouting proclamation of the Town Crier, Chris Whyman (3-time World Champion Town Crier, no less!). He was joined on the steps by the Mayor Bryan Paterson, who provided friendly remarks as well to the large crowd assembled. Everyone dispersed to enjoy looking at the cars or to stroll through the downtown business area. Capital Corvette Club members convened for a convivial dinner at the Lone Star Texas Grill. Then it was back to Market Square at 8:30 pm for a group photo, taken from the roof of a nearby building. And there was even a video made as we all departed en masse. Behold: the Rapid Rabbit rolls out at 11:21 in this video so we really were there! Back to the Ambassador Hotel afterwards, where 194 of the 254 rooms were taken up by Corvette people, with the parking lot arranged by colour for the driving tours scheduled for Saturday. 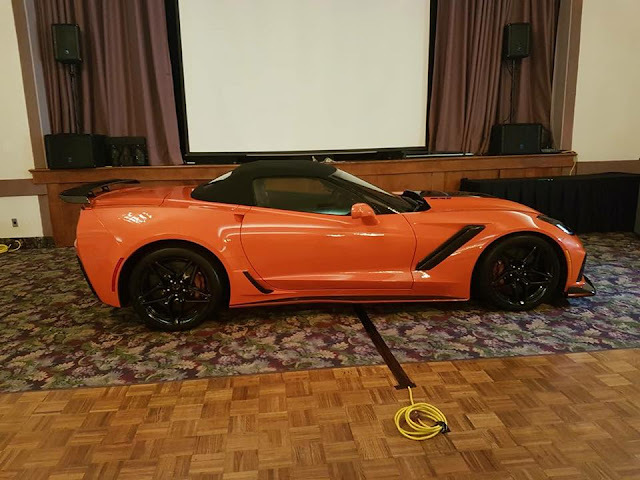 Organizers from the Corvette Club of Ontario spoke about their plans for the 2019 Caravan to the National Corvette Museum. While Friday's weather had been superb, Saturday began grey and overcast. I walked around the parking lot looking at all the Corvettes and taking some more photos. In spite of the threatening weather spirits were high as four driving tours were launched after 9:30 am. ACS Composites was present and doing installation work for those wanting side skirts and splitters. The road tours were around 120 kms and ranged from 90 minutes to 2 hours and before the rain began everyone was back in Kingston. Our tour, which took us northwards and then east along the wonderful twisting Opinicon Road to Chaffey's Lock on the Rideau Canal, ended at Old Fort Henry, which we had the chance to visit before returning the hotel and preparing for the evening's festivities. Once known as "the Citadel of Upper Canada," Fort Henry was constructed from 1832 to 1836, replacing a smaller structure that had served in the War of 1812. Now a UNESCO World Heritage Site, the fort was built to protect the shipyards in Kingston as well as the entry to the Rideau Canal but as relations between Britain and the United States improved, the fort, which was never under attack, gradually fell into disrepair after its last garrison of Canadians departed in 1891. In the 1930s it was restored and is now under the management of Parks Canada. Commandant's office, including documents sealed with government red tape. Note the gun port windows in all the rooms! In addition to period rooms showing the life of British military personnel, there are rooms devoted to the history of the fort, its restoration and Canadian military history as well. Fort Henry has many events in addition to artillery and rifle demonstrations, such as a massed band tattoo, an obstacle race, a haunted walk, and other family-friendly activities. Unfortunately, the weather was poor during our visit, with ice cold rain falling, so our stay was shortened somewhat and we left for the hotel and our evening banquet. Thin defence tower at Fort Henry. the city has four of the wider, more powerful Martello Towers to defend the harbour area. Two of these are now museums. The ballroom of the Ambassador was packed by 6 pm and the room offered unique décor: an orange ZR1 convertible provided by General Motors and trucked in that afternoon. “Lucy” has the serial number 00012EX, indicating she is a prototype car and, sadly, will meet the fate of all GM prototypes but it was an indication of the Corvette Invasion's organizational efforts to get her there. There was a 50/50 draw that gave the lucky winner $1300, and door prizes galore. Post-dinner attendees enjoyed the live band, the ToneKats, a four-man local group playing energetic cover versions of popular songs. The parking lot emptied out on Sunday morning as everyone headed for home. In addition to the excellent organization of this first-time and ambitious event, primarily by only three couples, it was clear that the Kingston Corvette Invasion had received excellent community support and great local enthusiasm.